Croatian Čupavci (CHOO- pahv-tsee) are deadringers for Australian . Čupavci are small sponge cakes filled with custard, dipped in chocolate, and covered with coconut. The Croatian name comes from čupavi, which means "furry," from the look of the coconut. Some Croatian recipes call for honey in the sponge and rum or other liquor in the chocolate, and some cover the entire sponge cake with chocolate and coconut while others just cover the top. Compare with the world's easiest cookie recipe. 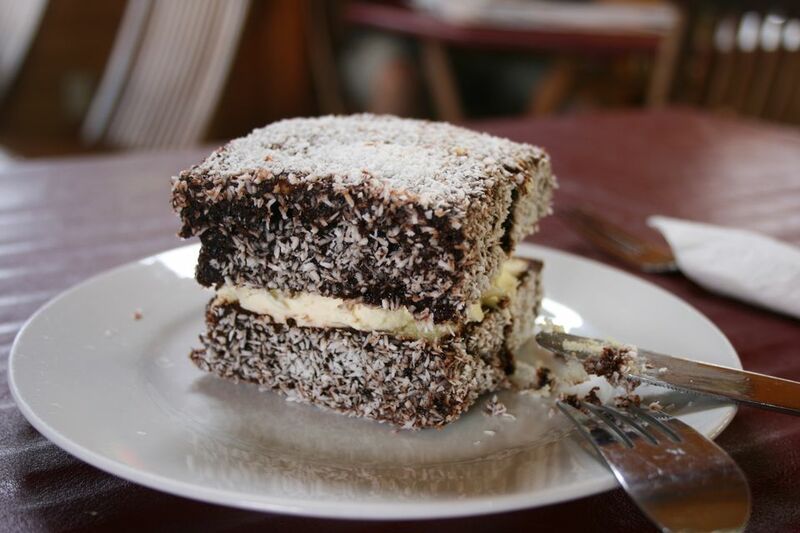 Here is a larger photo of Croatian lamingtons or cupavci. Slice cooled sponge cake in half horizontally. Place bottom half into a clean parchment-lined 13x9-inch pan. Pour pastry cream on top and then place top half of sponge cake on pastry cream. Place in freezer for several hours or until firm enough to cut easily. To make chocolate coating: If you are only going to cover the tops of the squares, use 4 ounces of chocolate and 1/2 cup milk, otherwise, use the larger amounts. In a microwave-safe bowl, place chopped chocolate and milk. Heat for 1 minute. Remove from microwave and stir until smooth. The chocolate should be on the thin side but not runny. You may have to add more milk. Set aside to cool slightly. Invert sponge cake onto parchment paper and peel off parchment paper that lined the bottom of the pan. Invert again onto a cutting board. Trim all four sides of the filled sponge cake so you have a perfect rectangle. Cut into 24 even squares. Make sure squares are semi-frozen before dipping in warm chocolate, otherwise, the pastry cream will run out. Quickly dip all sides of the squares into chocolate, then dredge in coconut. It gets a little messy, but the result is worth it. For a neater job, dip only the tops of the squares in melted chocolate and dredge only the tops in coconut. Store covered in the refrigerator.